Sure, you love the convenience that appliances such as your washer, dryer, dishwasher and refrigerator bring to your life. 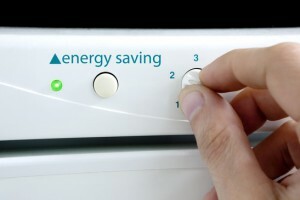 But did you know that these timesaving machines drink up almost $300 per year in energy costs? Fortunately, there are some relatively simple things you can do to maximize the efficiency of the devices you use every day, techniques that will most likely also have the side benefit of keeping the appliance repair company away. When the time comes to replace any one of your appliances don’t overlook the advantages of purchasing an Energy Star-certified model. The United States Environmental Protection Agency has created this rating system to let consumers know which appliances use energy with the greatest efficiency. As you peruse the aisles of your local appliance store, be sure to also look for the yellow energy guide label, which tells you how energy-efficient the item is in comparison to its competitors by giving you its estimated annual operating cost. Wash and rinse clothes in cold water with cold-water detergent. Doing so saves you money because you don’t need to pay to heat the water. In the case of eliminating grease and other stubborn stains, consider switching from hot to warm water. In most cases, hot is overkill and warm works just as well. The next time you’re in the market for a washer, choose a high-efficiency model. These use special high-efficiency (HE) detergent that is less sudsy and requires less water to rinse off. Always separate heavy items such as towels from the rest of your laundry. These take longer to dry, and your dryer will not shut off until its moisture sensor indicates that even the heaviest items are moisture-free. As a result, your other clothes will be “cooked” and your bill will rise. Reduce the danger of fire and improve air circulation by cleaning your dryer’s lint screen before each use. From time to time, use the nozzle on your vacuum to clean under the screen as well. When possible, give your dryer a rest and hang your clothes on a clothesline or an indoor drying rack. Keep separate freezers at 0 degrees F and your regular refrigerator at the recommended 36 degrees F.
Periodically check to be sure your doors seal tightly. If a paper inserted in the closed door can be easily pulled out, it’s time to replace the seal, tweak the latch, or buy a new fridge. Cover all items in your fridge. Doing so will minimize the moisture emanating from your foods and reduce the work your compressor must do. When considering buying a new model, keep in mind that appliances with the freezer on top are generally more efficient than side-by sides. Also, water dispensers and icemakers definitely increase your energy usage. Follow your manufacturer’s advice in terms of heating the water. Generally, it need not be hotter than 120 degrees F.
Don’t run your appliance until it is full. Consider doing your dishes by hand if you only have a few. Instead of using the hot air drying setting, let your dishes dry naturally. Just open the door a crack and let the air do the work. When buying a new unit, be sure that it only uses the required 4.25 gallons of water per cycle. Older models often use more than twice that amount. When taken separately, each of these strategies might not seem like much. However, when you combine them and are scrupulous about how you use and purchase your various appliances, you can definitely see your savings increase. When you think about it, aren’t there plenty of ways you could better spend that money? We thought so.